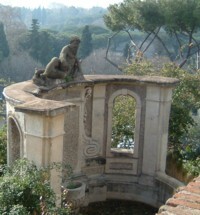 Villa Celimontana is one of Rome's loveliest, and most hidden, public gardens. This piece of land on the Celio (Caelian) hill, previously a vineyard, was acquired by the Mattei family in the sixteenth century and converted into gardens and a building that was to be used for entertaining and for housing the family's collections of art and antiquities. 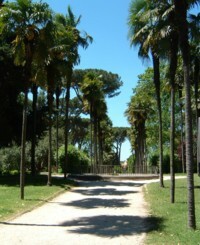 Peaceful, safe and beautiful, the park is an oasis of greenery and birdsong in chaotic Rome. Pieces of ancient carved marble (part of the Mattei family's collection) litter the pathways. There's a small concealed obelisk, a couple of fountains, and a fishpond to fascinate children. It's a lovely spot for a picnic, and makes a good break from sightseeing duties - although you may find it hard to get up and leave. The park is a favourite location on the endless Italian wedding photo-shoot circuit, and on summer days you'll often come across bride and groom on posing duties. 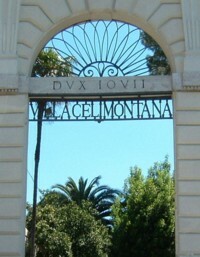 Villa Celimontana has two entrances; the main gateway is on Piazza della Navicella. A short driveway approaches the villa building, which is now the home of the Italian Geographical Society. To the left of the building are some winding pathways, a green lawn, and amazingly tree-girt views over southern Rome and the massive ruins of the Baths of Caracalla. Looking over the panoramic parapet, you can see more overgrown sections of the old landscaped gardens, beyond the boundaries of the present park. To the right of the main building is a charming sloping area planted with different types of tree, and offering plenty of both shady and sunny picnic spots. Further on there is also a small childrens' playground, with pony rides. The second gateway to the park is on the Clivo Scauro, the old Roman road running over the Celio hill. This exit is convenient for seeing the other sights of the Celio, and for descending towards the Circo Massimo (Circus Maximus). The park is often home to art exhibitions and special events. In the summer a series of evening jazz concerts is held here. Villa Celimontana is open daily from 7am until sunset. There are toilets and a drinking water fountain, although unfortunately there is nowhere close by to purchase food (so bring a picnic with you). Bus number 81 stops right outside the main entrance on Via della Navicella. To walk from the Colosseum, head up Via Claudia, with the ruins of the Temple of Claudius on your right.